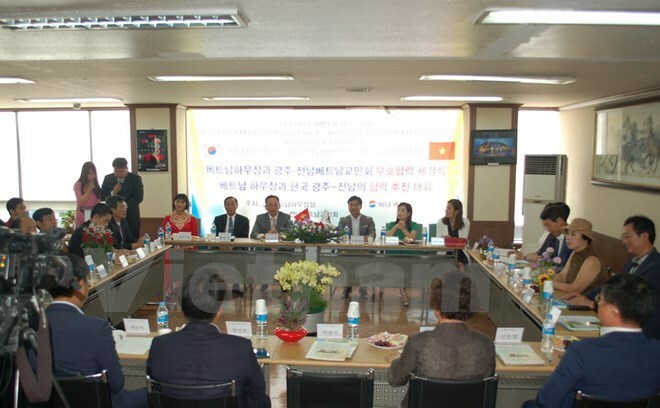 Seoul (VNA) – The Mekong Delta province of Hau Giang held a workshop in Gwangju city, the Republic of Korea (RoK) on August 4 to call for the Northeast Asian country’s investment in the fields it is prioristing. Chairman of the Hau Giang People’s Committee Lu Van Hung highlighted his province’s natural and social advantages, noting that aside from the Government’s incentives for foreign investment, Hau Giang pledges to create more favourable conditions for foreign investors, especially those from the RoK. The RoK is an important partner of Vietnam as well as Hau Giang since it is an agricultural products importer and also a supplier of production, processing and preservation technologies and machinery for the province. Officials from the Vietnamese province introduced prioritised projects that need investment, including those in high technology, agriculture using bio-technology, and tourism. As both Hau Giang and Gwangju boast strength in agriculture and processing, the two sides can easily have a common voice in cooperation activities in the time ahead, they said. At the workshop, representatives of RoK businesses raised questions to learn more about Hau Giang’s incentives and natural conditions. They valued the province’s human factor in investment attraction efforts. The two sides affirmed that they will keep contact to step up investment and cooperation in the coming time.